Camouflage-clad Chengdu residents head out to play laser tag in an area near the ruins of homes destroyed in the earthquake. Photos of Beichuan's county seat before and after the earthquake are for sale on a hillside overlooking the ruined city. 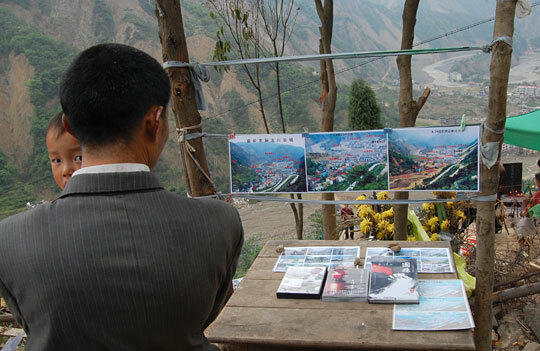 Liu Xiaohua, who lives in temporary housing in Beichuan, is uneasy about the plans to build a quake museum on the site of the destroyed Beichuan Middle School. "So many people died; their bodies are still buried," she says. "Of course we don't feel good about it." 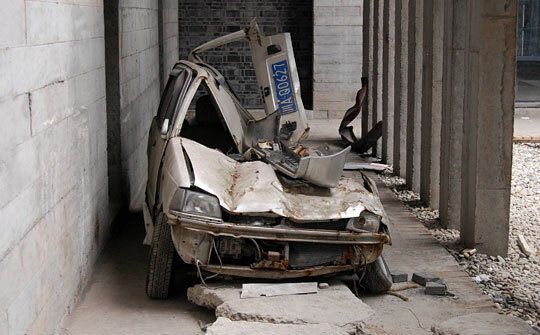 This crushed car will go on display at the Jianchuan Earthquake Museum on May 12. The museum's founder, Fan Jianchuan, says the point of the museum is to memorialize the earthquake and learn how to protect against future quakes. When I came back to southwest China to report stories leading up to the May 12 anniversary of the earthquake, I never imagined this scene: I'm running through a mountain park alongside young warriors wearing camouflage suits and toting plastic laser guns. They kneel and take aim through the trees as a loud, synthesized firefight echoes around us. I'm in the middle of a game of laser tag at the Counter Strike battlefield, high up in the mountains outside the town of Baoshan. The site is part of a growing industry all around the earthquake zone: earthquake tourism. The Counter Strike laser tag park is based on a shoot-'em-up video game. The battlefield where the two armies face off is a lush garden filled with huge pink peonies and moss-covered pagodas. The laser-tag warriors shoot it out steps away from homes that were destroyed by the earthquake, their ruins still huge heaps of mangled concrete and twisted steel. The battlefield park was developed by the Baoshan Group construction company. The head of the tourism section, Dai Jun, explains the idea behind it: It's designed to provide a team-building exercise for office workers who might drive up from the city. At the same time, Dai tells me, it will help the local economy recover. "I think building this base here provides more job opportunities for local people, and I don't think it's unfair to those who died in the earthquake," Dai says. I ask him, "Even though the people who play these games are simulating death in an area where death was very real for so many people?" "The people in disaster-hit areas need to get back to a normal life," Dai says. "They need to walk out of the shadow of this disaster as soon as possible." So this is the new normal. 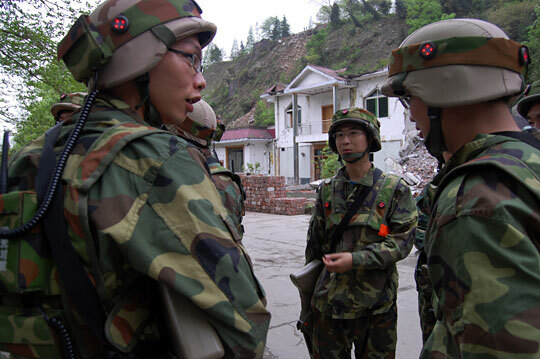 One of the young city visitors, Counter Strike warrior Zhang Ling, tells me, "We need to let everyone know the earthquake of May 12 has passed." "This game teaches us that we need to stay united and help each other," Zhang says. "After the earthquake, the relief effort went so well because the Chinese people united as one. We're here playing this game with the same goals in mind. It's not just about battling each other." Two counties away is another promised tourist destination: the flattened city of Beichuan. An earthquake museum will be built on the site of the destroyed Beichuan Middle School. Hundreds of children died when the school collapsed, and it is now a ghastly pile of debris and twisted rebar. It's hard to imagine that in the future, this schoolyard will become a tourist site. Visitors will be allowed to walk through the ruined city, where many bodies still lie buried beneath the rubble. Some local residents are not at all happy about that idea. Just down the road, I meet Liu Xiaohua at the temporary housing camp where she lives with her family. 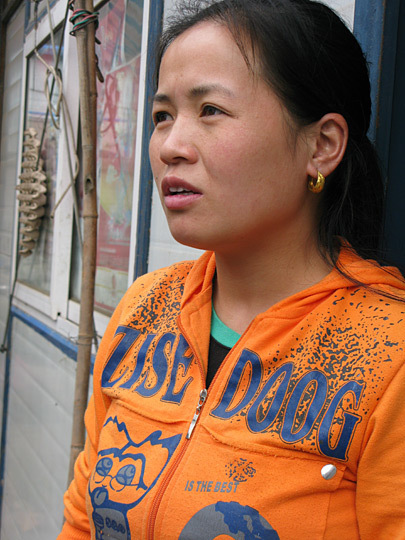 Her mother-in-law was killed in Beichuan, the body never recovered. "Many of us feel uneasy" about the tourism plans, Liu tells me. "So many people died; their bodies are still buried. Of course we don't feel good about it. There are so many bodies that can't be retrieved." But the deputy county chief of Beichuan, He Wang, sees tourism as an important way to revitalize the area, memorialize the dead and promote national unity. "It will be a somber environment," he says. "I believe that everyone who visits the Beichuan ruins will experience a spiritual baptism, and at the same time learn something about humanity and patriotism." I ask him, "What would you say to people whose family members may be buried in that rubble who say, 'This a private space. I don't want people coming here to look at this. This is my graveyard'?" "We need to respect the feelings and wishes of the victims' families," he says. "But I personally believe that we'll be able to gain the families' understanding." There also are plans to turn a huge earthquake lake into a tourist spot. The quake lakes were formed when landslides caused by the temblor dammed up rivers. A year ago, people feared those lakes would burst and cause disastrous flooding. But now they're making the best of the situation: The plan is for the quake lake of Tangjiashan to become a destination for boating, with teahouses lining the banks of the lake. We made one last stop on our earthquake tourism circuit: the new quake museum in Dayi, about 100 miles southwest of Beichuan. It's set to open on the anniversary of the quake. The museum is the brainchild of wealthy real estate developer Fan Jianchuan. He has scooped up tens of thousands of earthquake artifacts for his collection, everything from a rescue boat to children's backpacks gathered from a collapsed school to the now-famous "earthquake pig": a sow who is said to have survived for 36 days in the rubble of a home. Her nickname is "Three-Six." And get this: As soon as he has enough money, Fan tells me, he is going to install three earthquake simulators. "The room will shake," he says, "The ceiling will collapse, TVs will come crashing down, the sounds of people screaming will come out of speakers. Just like a Hollywood movie." Having experienced firsthand the terrifying, stomach-turning force of the temblor when I was in Sichuan last May, I'm horrified, but intrigued. I ask Fan who would want to experience the simulation. "I think young people will be very interested," Fan says. "I've found that earthquakes happen every 30 years or so. When another one comes, I'll be 80. It won't matter if I die. But I want young people to learn how to protect themselves against the next one. Only then will our society have hope for the future." Fan tells me he worries that people will forget what happened here last May. His museum is a bulwark against oblivion. On May 12 at 2:28 in the afternoon — the minute the earthquake struck last year — a siren will sound and Fan Jianchuan's earthquake museum will open for business.